Fans of post-apocalyptic romances, rejoice! Sci-Fi Romance Quarterly #8 delivers loads of post-apoc romance action for your reading pleasure. Fans of science fiction romance, rejoice! The latest SFRQ brings a bonanza of SFR fun right to your virtual doorstep. * Sneak Peeks, New Releases, Reviews, and more! 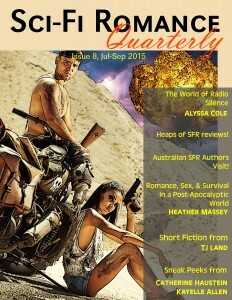 Download your free copy of Sci-Fi Romance Quarterly #8! Happy reading!